A certain amount of copying is inevitable among chefs, who spend a great deal of time, effort, and expense into heating and serving food that is, for the most part, widely available to everyone at every supermarket in America. When the first chef served bacon in a fancy restaurant whenever it was 15 years ago, it’s not like he invented bacon. But when Bruno Goussault invented the sous vide egg, that was something unique, involving thought and hard work. Copying that without attribution is not the same thing. In any case, the Flying Pig started out as a food truck started by a couple cooking school grads with the idea of bringing a mix of classic cooking techniques with Asian street food flavors. 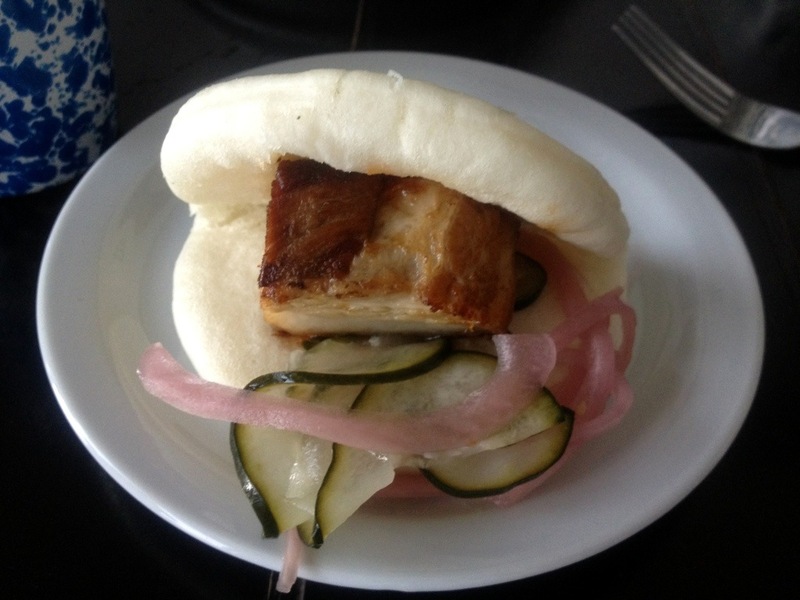 They quickly gained some renown with a pork belly in a Chinese bun, a dish they served without attribution to David Chang. For anyone who has been to the Momofuku restaurants in NYC, the pork buns are what created a two-Michelin star empire. 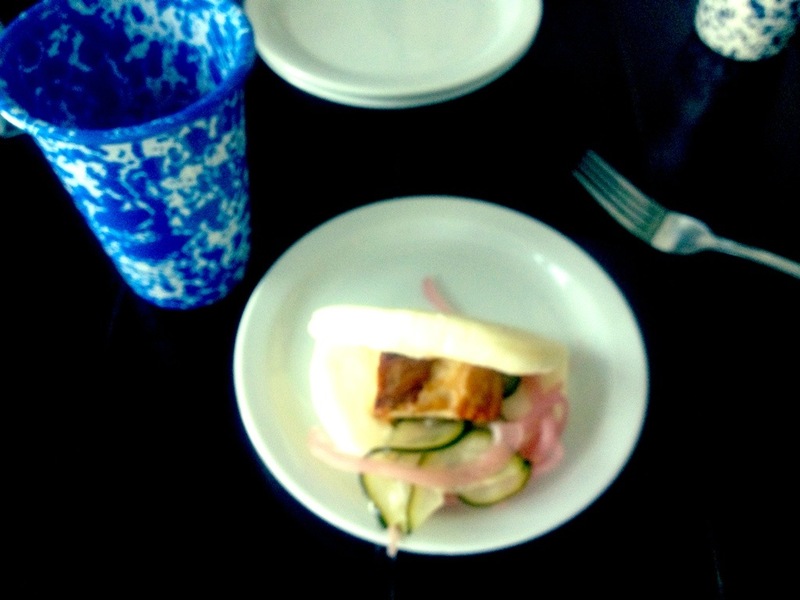 Chang took a classic Korean staple, thick-cut pork belly, and served it like a Chinese sandwich, in a Chinese steamed bun, with a bit of hoisin sauce and pickled cucumbers. Brilliant. It’s also a Momofuku signature that dates back to at least 2005. So what does it say about this place and the owners that they serve the exact same dish without mentioning that they straight ripped it off from the Momofuku cookbook? Maybe worse than the plagiarism is the fact that the Flying Pig’s pork belly buns are not nearly as good as the original. They don’t manage to get a good sear on the pork belly, which leaves you with the too obvious feeling that you’re biting into a hunk of fat. The other components are OK, but I am not not sure they made the steamed bun. Their version was a bit dry, but that could be because it was sitting around. 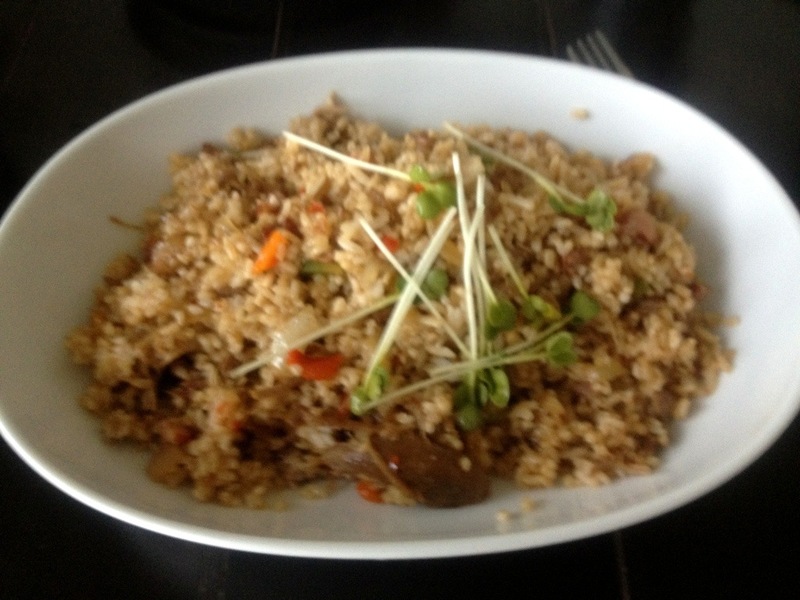 Here’s the duck fried rice. This was better but not awesome. Again, the idea is good but maybe their wok was not hot enough to get any crispiness on the rice. It was also a bit underseasoned. This is their tofu burrito. Maybe this is on me for ordering a tofu burrito. But this was actually a bad dish. They took a block of tofu and kind of warmed it, but it still felt like biting into a lukewarm, unflavored block of tofu. 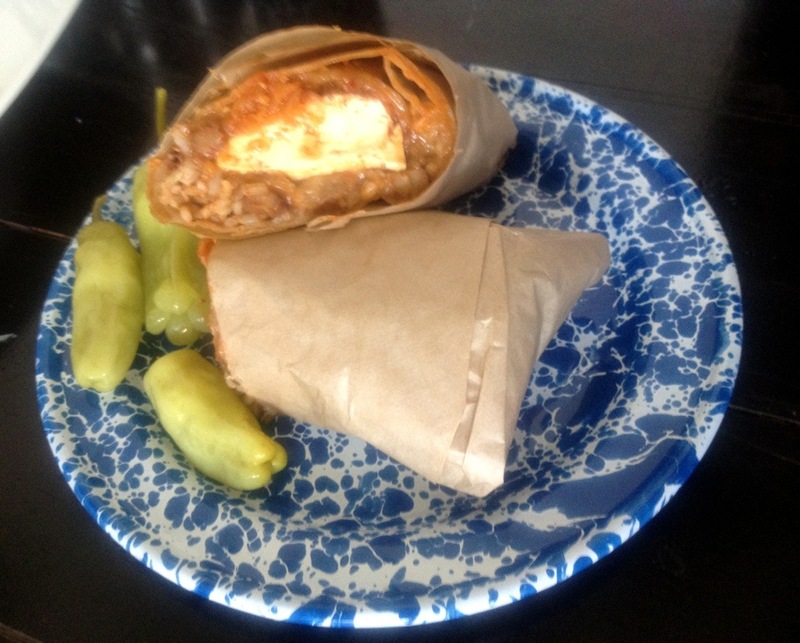 The interesting part was that they used Korean spicy gochujang paste to flavor the burrito. Aside from the fact that the Flying Pig blatantly stole the Momofuku pork bun recipe, the problem with this place is execution. They have some good ideas for fusing Korean and Hawaiian flavors with tacos and burritos. But everything I’ve had is no better than pretty good, and is too often disappointing. Anyways, if you’re going to have the gall to rip off one of the highest profile restaurants in NYC you should at least do a good job of copying. Also, you should make the ramen. Because I’m getting tired of hearing from Chang that he has no plans to open in LA. great write-up! i tried flying pig recently and was completely unimpressed. i didn’t recognize the momofuku knock-off though – will have to try the original someday!